Pressure is a force applied to a physical object. In this case, the force will be a liquid or gas being applied to a surface. We use pressure gauges to measure this force. Why do we need to measure pressure? Measuring the pressure of a substance is important in any manufacturing process as this will determine the quality of the product being manufactured. For this reason, accurate measuring instruments are a must – so the pressure can be measured throughout. Once the pressure gauge is connected to the gear and shaft assembly, this will start to coil and uncoil the inner bourdon tube. The more pressure added the more the internal bourdon tube uncoils. As the pressure increases, you will see the pointer on the front of the screen move in a clockwise motion. As the pressure decreases, this pointer will start to move anti-clockwise allowing you to control the process. What is the accuracy class of a pressure gauge? The accuracy class is the difference between the true value and the indicated reading expressed on the pressure gauge, as a percentage of full scale span. The accuracy class is shown on the dial as Acc, Class, Cl or Kl (e.g. Cl 1.0 for 1% of full scale value). What’s the difference between a standard and a safety pattern gauge? The safety pattern gauge is constructed for the gas industry and are therefore designed with the operator of the gauge in mind. When constructed an additional solid baffle wall is welded between the measuring system and the dial. The glass of the dial is also safety glass and in the case of a rupture the back wall will completely blow out. Why do we fill a pressure gauge? We fill pressure gauges as vibration will cause a pressure gauge to wear rapidly. Furthermore, it will cause the pointer to oscillate making reading of pointer difficult. Filling the gauge with Glycerine, reduces vibration, thereby extending the life of the gauge and making reading easier. Other fill fluids include Silicone Oil and Openol (for use with electrical contacts). How to choose the scale of a pressure gauge? The maximum operating pressure should not exceed 75% of the full scale range. The normal operating range should be in the middle half of the range whenever possible. For example, if a customers process is at 50 psi, a Pressure Gauge with a range of 0 to 100 psi, should be selected. How do I choose the size of my pressure gauge? The important factor when deciding the size of your pressure gauge is that the dial can be easily read once the gauge is installed. We offer a range of different sized gauges (40mm – 250mm!). Standard pressure gauges can be supplied with NPT, BSP or BSPT connections. These connections are available in stainless steel, brass and monel (wetted parts). What is the material construction of my pressure gauge? It is critical that the materials of the gauge’s pressure system are compatible with the media that its measuring. 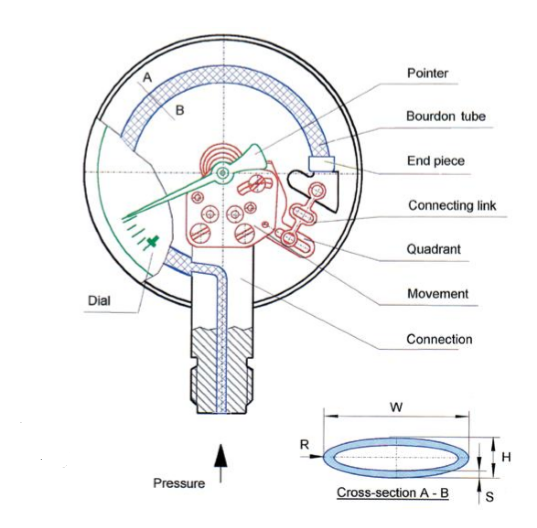 For applications where standard gauge materials or fluid characteristics are not compatible with the media, a diaphragm seal may be needed to protect the pressure instrument. If you have a question that isn't answered here, why not ask us!